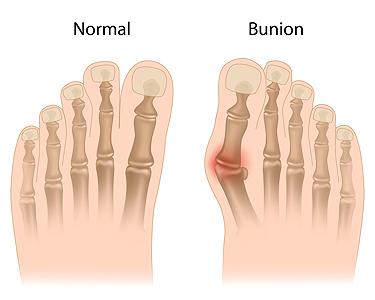 Genetic factors are important in the formation of bunions; people who get bunions are usually genetically predisposed to this bone displacement. While wearing ill-fitting shoes will not create bunions, doing so can exacerbate existing ones. A podiatrist who specializes in foot structure and biomechanics can quickly diagnose bunions. Bunions must be distinguished from gout or arthritic conditions, so blood tests may be necessary. The podiatrist may order a radiological exam to provide an image of the bone structure. 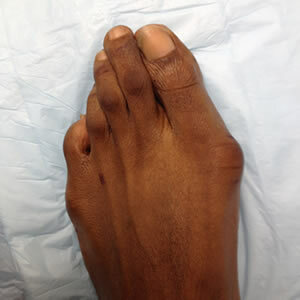 If the x-ray demonstrates an enlargement of the joint near the base of the toe and a shifting toward the smaller toes, this is indicative of a bunion. For cases that do not respond to these methods of treatment, surgery can be done to reposition the toe. A podiatrist may do this by either removing a section of bone or by rearranging the ligaments and tendons in the toe to help keep it properly aligned. It may be necessary even after surgery to wear more comfortable shoes that do not put pressure on the toe as the big toe can easily move back to its orientation toward the smaller toes.